Mike teaches private guitar lessons to a small group of fantastic students, after years of maintaining a full-time schedule (before his children arrived on the scene). He also serves as kindergarten music teacher at Ecole Bilingue de Berkeley. 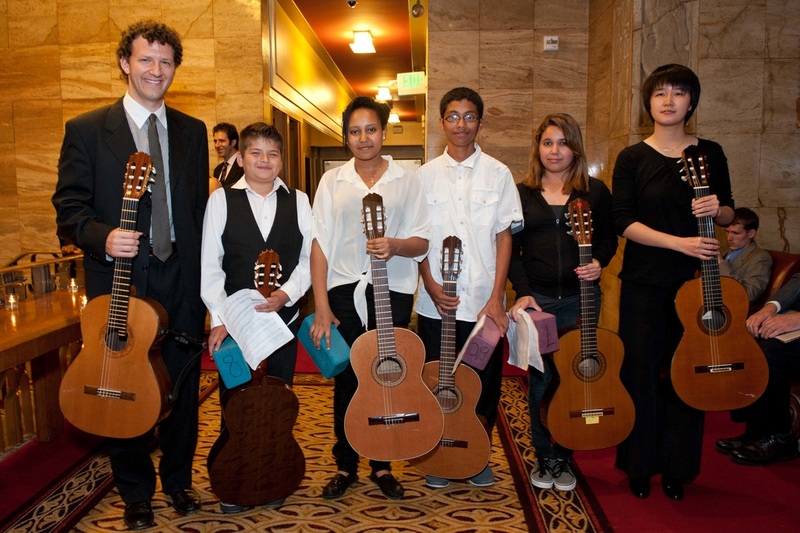 ​Until recently he served as Guitar Mentor at Westlake Middle School in Oakland, via a grant from San Francisco Performances and Arts for Oakland Kids. Interested in lessons for yourself or your kids? Please contact Mike for current availability. For lots more information, please see the Guide to Lessons. For more on Mike's teaching experience, please see Highlights from the Musical Life of Mike. "Mike is a fantastic instructor and person. He is very concerned that your lessons follow along with what you want to learn to help you play your style - and expose you to a broader world of music than you anticipated. The 1-hour lesson format works great for me. The typical session involves some theory, some playing, and filling in the holes in between. He is always prepared for your session and knows where he wants to take you that day. His easy-going personality and enthusiasm makes it easy to digest what can be some difficult concepts. He is not the type of instructor who force feeds you riffs week after week, expecting you to put the pieces together. His instructional approach is logical and builds on the previous lessons. I would highly recommend you check him out if you are serious about your lessons." considerable knowledge and musical abilities, he is very creative in finding ways to help you improve your technique and musicianship. There is a clear and cohesive plan for every lesson as he keeps a journal for every student. More than any other teacher I have studied with in the states and in Europe, he has a gift for identifying what is unique in my approach to music and the guitar. I am a much better guitar player and creative individual thanks to his considerable talent and caring. Thank you Mike!" For those of you reading this, Mike is a inspirational teacher - one of a kind! I first heard of Mike when he was a student at Dartmouth and I was there as a faculty member. At that point (age 47) I had just picked up the guitar and at best knew a few chords. I sought Mike out, as he was known as the best guitarist on campus, and managed to get lessons. I even think I was one of his first students. Mike opened up the world of music to me and I never looked back. He has a wonderful way of finding out where your talents lie and building your confidence in expressing yourself through music. But it goes beyond that, as our lessons are filled with discussions about life and how you approach it. I was sad when Mike left Dartmouth and I moved to California to go to Stanford as I thought we had parted forever. I was so pleased that we again joined up in San Francisco. Now he teaches classes at my house at Stanford, where I get to watch him work with many of his students and some of those students work with me at Stanford. As a fellow teacher (albeit in Geology) I love watching and learning from Mike how he approaches and works with students. It is an inspiration to me as a fellow teacher. As for me, I have gone beyond a few chords and he still has the patience to watch someone in their 50s take on a subject that has always been assigned to the young. In short, if you have the chance to meet Mike do so, play music with him, and find your talents through his. I started bluegrass bass lessons with Mike last spring. Despite the fact that Mike did not feel he was qualified to teach me correct upright bass "technique," he has still managed to teach me a lot in a very short period of time. Although I took piano lessons for ten years, I never successfully learned the details of musicality, keys, or chord progressions. Mike has managed to teach me more in a few months than I ever learned while taking piano. Mike is a very talented musician and a very patient teacher. I especially enjoy that he is welcome to any suggestions I make about new things I would like to learn. Overall, I really enjoy going to lessons! Guitar lessons with Mike were most awesome, and everyone should check it out. He’s really open about whatever style of music you want to play. Whether it was Nirvana, John Mayer, Led Zeppelin, or Fernando Sor, I totally rocked my socks off with guitar lessons. Mike was really encouraging and supportive, no matter how much I thought I sucked. More importantly, he never shouted at me like evil piano teachers did if I didn’t practice as much as I should have (haha). So go now! Take lessons with Mike! Don’t lose any time!